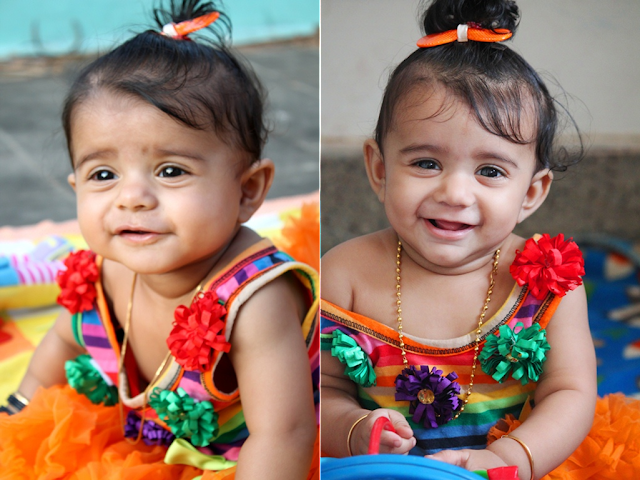 Maha - My Life: Little Tutu Trying to Stand Up! Sorry guys for not active for the past few weeks. I was very less inspired to post here, and literally ran out of ideas. Also i was very hectic with all those diwali posts on yumm tummy. So i forgot to share posts here. I wanted to share something on my baby blog to keep it alive, so thought of doing this picture posts. Yesterday i thought of taking few shots from her 6th month. I put maha's dress and hair clip which i saved. Dressed up mahi and took the 6 month pictures. When i collaged mahis picture with maha, i was surprised they looked exactly like twins. Here is the picture for you, incase you missed it. And when i was shooting, mahi tried to stand by holding the table. I shot random pictures of that. Here are the shots for you. This is what you do when you literally run out of post. SEE YOU SOON WITH ANOTHER USEFUL POSTS!